Pre-teen Alyssa Perez, a bordering-on-shy, sixth grader who likes to play chess, discovered her voice in the Kindness Academy at Navarro Middle School in Lamar Consolidated Independent School District. Her principal Stephanie McElroy believes what kids have to say is important, and staff listens in order to help build a positive school community. Introduced to the school last year, the Kindness Academy is multi-faceted but thrives on the basic principle of spreading goodness, not bullying. Harris County Department of Education’s Center for Safe and Secure Schools works as consultants with Navarro to provide resources for character education through a program called Restorative Practices. Restorative Practices strengthens relationships between individuals and promotes social connections within school communities. School safety and security specialist Janice Owolabi meets with staff at Navarro for trainings on student behavior and de-escalation strategies. The student component focuses on building the momentum of “Acts of Random Kindness” or ARK. “The Center for Safe and Secure Schools is excited to work with Navarro to promote safe, structured, nurturing environments for an anti-bullying culture,” said Owolabi. The low-income school is 75-80 percent Hispanic, and some of its 500 students come from foster care or group-home backgrounds. Research supports establishing community and respecting student voice to promote the social-emotional development of students. Students and staff each belong to four houses. The goal is to build a family culture within each house. Students earn points for the positives: grades, acts of kindness, effort, campus participation and behavior. Instead of focusing on anti-bullying education, the goal is to teach children to combat hatred in society. “The best, most impactful way to do that is to teach children compassion, caring, courage and kindness,” said McElroy. Giselle Hernandez says the Kindness Academy taught her to reach out to others, like the new girl who had no one to talk to. With the introduction of the Kindness Academy, students are not allowed to have cell phones on campus. The overall reaction has been positive, according to Hernandez. 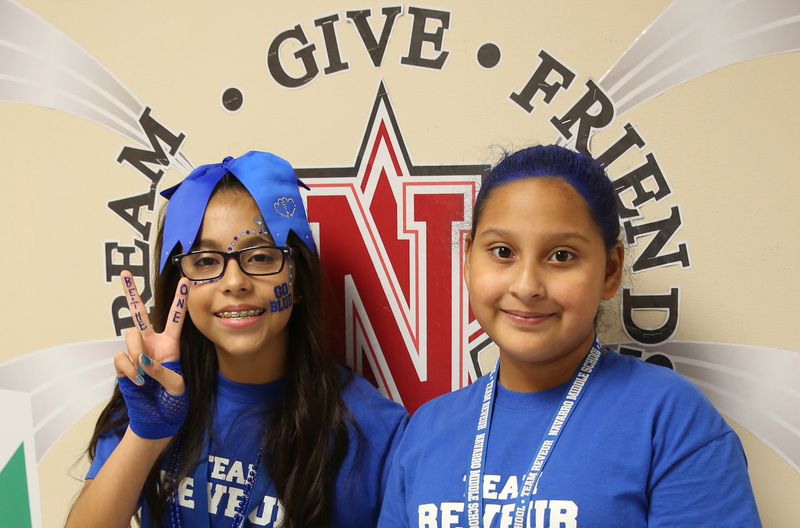 Kindness continues to spread at Navarro. Counselor Tanesha Crockett says the school is building a community of support for each other. A student steps into her office and she sets aside the mountain of paperwork to ask how the day is going. That student is off to a house pep rally, one of four held during the year to promote a sense of community. The halls are filled with drumbeats, chants and students who have a collective sense of well-being. Perez, 12, hangs out with her siblings and talk to her dogs when she’s a little sad. Her empathy for others is deep because of the acts of random kindness mentality. She continues to grow her leadership skills in her school. Hernandez is intent on cultivating her kind voice too.